See the best to be the best. Every year, Ballistic Publishing brings together the world’s leading digital artists to create EXPOSÉ, a compilation of the finest digital art in the known universe. In its fourth year, EXPOSÉ 4 celebrates the talents of artists worldwide, featuring 317 artworks from 241 artists in 49 countries, selected from over 5,000 submissions. 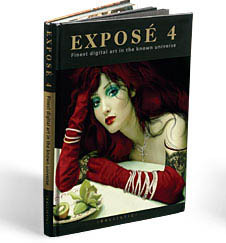 With EXPOSÉ 4, you can own the best digital art in a book of exceptional quality. You will be inspired by the amazing skills of the artists. Fantasy, Exterior Architecture, Interior Architecture, Portrait (Painted), Portrait (Rendered), Action, Conflict, Faery Folk, Creatures, Environment, Cityscapes, Matte Painting, Science Fiction, Abstract & Design, Product Design & Still Life, Horror, Surreal, Humorous, Whimsical and Transport. 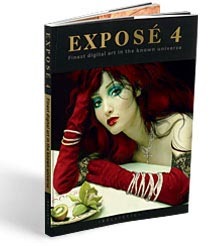 EXPOSÉ 4 is judged by an internationally acclaimed panel of artists and creative directors. From a selection of over 5,000 entries, the advisory board agonised over the multitude of excellent artwork. From this, 317 of the best artworks were chosen.